understanding of contemporary evolutionary biologists. and Carter, 1994; Huey and Berrigan, 1996). scarcity in its semi-arid habitat. rodent, aquaporin, degu, Octodon degus. 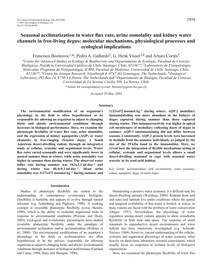 able to efficiently reabsorb free water (Nielsen et al., 2002). AQP-2, on urine osmolality and on total water flux.